It was a sin to hang garlands on a Maypole, to drink a friend's health, to fly a hawk, hunt a stag, to play at chess, to wear lovelocks, to put starch into a ruff, to touch the virginals [a predecessor of the piano], to read the Fairy Queen.--Rules such as these, rules which would have appeared insupportable to the free and joyous spirit of Luther, and coutemptible to the serene and philosophical intellect of Zwingle, threw over all life a more than monastic gloom. The learning and eloqueuce by which the great reformers had been eminently distinguished, and to which they had been, in no small measure, indebted for their success, were regarded by the new school of Protestants with suspicion, if not with aversion. Some precisians had scruples about teaching the Latin grammar because the names of Mars, Bacchus, and Apollo occurred in it. The fine arts were all but proscribed. The solemn peal of the organ was superstitious. The light music of Ben Jonson's masques was dissolute. Half the fine paintings in England were idolatrous, and the other half indecent. 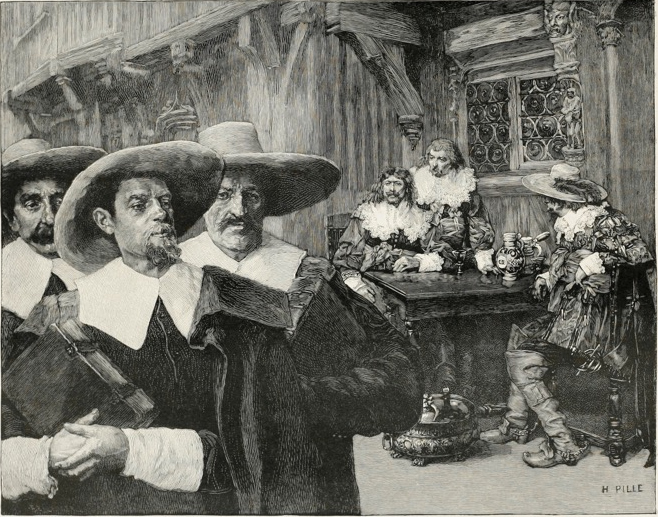 Puritans and Cavaliers. H. Pille. Source: Internet Archive online version of the Magazine of Art. “From the Painting by H. Pille at the salon of the Champs Élysées, Engraved by J. Bellenger.” Click on image to enlarge it. The painting above provides a French artist’s interpretation of the two sides in the seventeenth-century English Civil War.